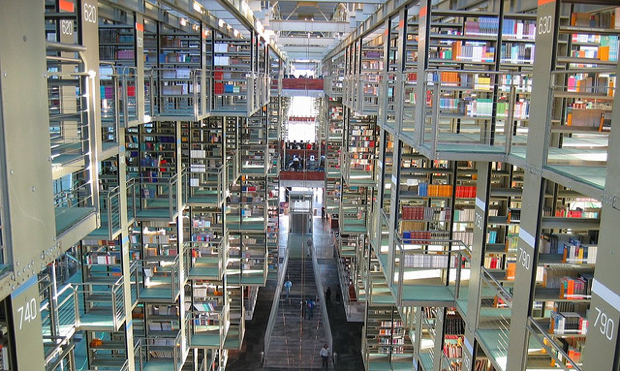 Google’s Digital Library Failed–Can Academics Succeed? Academic librarians, led by Harvard’s, are positioning themselves as the successors to Google’s scuttled vision for a massive digital library. But do they lack a coherent vision? Not long ago a federal judge in Manhattan scuttled Google‘s plans to create a digital universal library (a dream kicked off when Larry Page scanned “The Google Book” years ago–his company has since scanned 15 million more). While some lamented the decision, others have cheered, and among the latter is a group of academic librarians who think that a digital universal library should be a public, rather than a private, good. A digital public library faces as many or more hurdles as a digital private library, though–as Darnton is first to admit, problems “legal, financial, technological, political.” The main question that remains then, is this: Can Darnton et al. make good on their claims that they can have what the Times calls a “working prototype” inside of a year and a half? Worrying signs abound: The digital public library has “no formal structure other than a steering committee.” There is far from unanimity of vision: “Everyone who is at the table has a different idea of audience, scope, content and governance,” one of the people involved told the Times. (Though Darnton told us last fall that at a meeting, thankfully, “everyone checked their egos at the door.”) And what does it say about your project if one of its members, Stanford librarian Michael Keller, is telling reporters that the project is “coming late to the party” and has “no practical plan for getting it started”? Academia is famously slow; businesses are famously fast. The lofty motives driving Darnton and his fellow advocates for a digital public library ought to animate them with the same passion that profit animates the folks at Google. It would be wonderful to be proven wrong about the differences between commerce and academia on this count. Meanwhile, though, the Chronicle of Higher Education reports on a recent meeting of librarians, the Association of College and Research Libraries’ conference, which gathered this weekend. It was led by Corey Williams, the associate director of the American Library Association’s Washington office. Ms. Williams also raised the idea of the Digital Public Library of America championed by Harvard’s Robert Darnton and others. Nobody in the room had an answer. Well, that doesn’t sound promising–but the final chapter on this story has surely not yet been written.